You have probably been following me on my Instagram and Facebook pages and noticed that I hadn’t posted much here in comparison. I am still super busy (as always), which is why these social media channels are a good way to follow me closely when I am traveling and to get some cool aviation pictures on a daily basis! 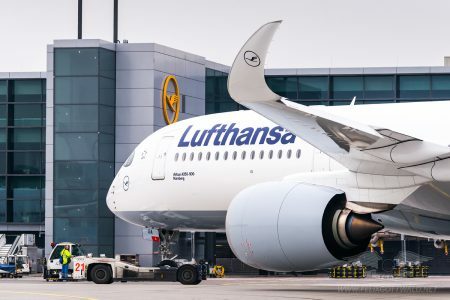 Yet still, I am happy to announce that a new image gallery is online with some stunning photos of Lufthansa new Airbus A350 on a visit at Frankfurt Airport. I haven’t personally flown on this type so far, but had the chance to capture images and close-ups of D-AIXA, the airline’s first A350 earlier this year. Clicking on any of these picture will take you directly to the new image gallery that features many more impressions! Rolls-Royce Trent XWB engine, specially designed for the Airbus A350! It is a Three-shaft, high bypass ratio, axial flow, turbofan engine that delivers up to 375 kN of thrust! Premium Economy is now located directly behind Business and in front of Economy Class – much bigger seats than in Y class. See all the other images in the Lufthansa Airbus A350 image gallery. I hope you like them! 2 Responses to Lufthansa A350 image gallery online! Great pics, as usual. You have a great feel for composition and contrast.